As I collapse in front of my computer to write this column, I’m still recovering from a two-hour yoga class. It’s December 21, and I’ve just finished a session at Synergy Studio during which participants were given the opportunity to perform 108 Sun Salutations. What, those of you who don’t practice yoga might ask, is a Sun Salutation? It’s a sequence of poses designed to acknowledge and honor the sun. 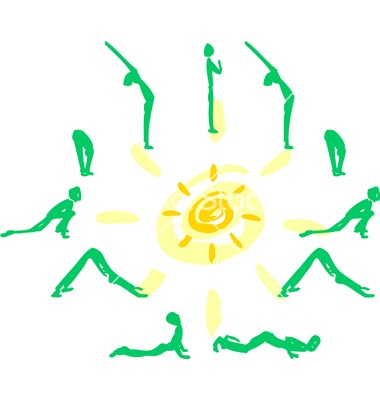 Some yoga practitioners perform salutations as a spiritual exercise intended to show gratitude and respect for the sun. Others do them to stretch and warm their muscles before beginning more intense exercise. Still others salute the sun first thing every morning as a wake-up ritual that helps start the day in calm and centered fashion. Synergy offered the salutation session today because it’s the winter solstice, the shortest and darkest day of the year. On December 22, the Earth’s axis will begin to tilt so that folks in the Northern Hemisphere will see the days gradually grow longer and the sunlight stronger. Saluting the sun during the solstice acknowledges this meaningful change and offers participants an opportunity to release the past, embrace the present and be intentional for the future. But why 108 salutations? Many Eastern religions and traditions, including Hinduism and Buddhism, consider 108 a sacred number. Some believe there are 108 types of meditation, others that there are 108 paths to God. And here’s something else I just learned. The distance between the Earth and the sun is 108 times the diameter of the sun. Not only that, the diameter of the sun is 108 times the diameter of the Earth. I’m about as green a yoga practitioner as it gets. I took my first class only a couple of months ago so I’m still in my rookie season. So far, I don’t find yoga nearly as much fun as playing ball or riding a bike, but it’s beginning to grow on me. It’s the first “quiet” exercise I’ve ever tried and learning to calm the hamster-on-a-wheel inside my head hasn’t been easy, but I’m getting better at it. It helps that my teacher is my dear friend Nicole, whose gentle and patient manner is bound to rub off on me sooner or later, I hope. Unfortunately, Nicole came down with the flu and wasn’t able to lead today’s session. Dawn, also an instructor at Synergy, took over and guided participants through a wonderful and challenging afternoon. The six of us positioned our mats like rays of the sun. We began with mountain pose, then lifted our arms toward the sky and went into forward fold, followed by half-lift. After that, things got tougher. Down to the mat for plank, then a controlled lowering of knees, chest and chin followed by cobra, downward-dog, back to half-lift and return to mountain pose. All while inhaling and exhaling at the appropriate time. Dawn prompted and counted for our first 36 rounds. Then she began to pull back, allowing class members to gradually assume control of the tempo and flow. And it was cool. Very, very cool. One of the best things about yoga is that it’s noncompetitive. There are no penalties and no shame for modifying a pose or taking a break. As to whether I actually made it to the magic number of 108, I’m not sure. I didn’t have a clicker and after a while it became impossible to count in my head. But I do know that I enjoyed my first Solstice Sun Salutation session very much. Maybe someday I’ll find it as much fun as playing ball or riding a bike. Or maybe not.